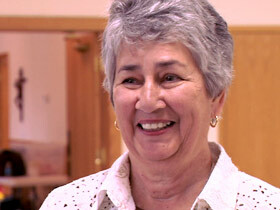 JUDY VALENTE, correspondent: Father Basil Doan is the pastor of two Catholic churches in this rural stretch of western Missouri. Several times a week, he makes the 50-mile round trip between his parishes along these quiet country roads. FATHER BASIL DOAN: No traffic. Peaceful, yeah. VALENTE: To keep himself alert, he sometimes sings in his native language, Vietnamese. Foreign-born priests are becoming a familiar presence in many rural communities, and, increasingly, those priests are Vietnamese. Father Basil’s order, the Congregation of the Mother Co-Redemptrix, has 500 seminarians in Ho Chi Minh City, the kind of numbers American orders haven’t seen since the 1950s. Seminaries and convents there can’t accommodate all of the men and women who want to enter religious life, so many end up here in America. Carthage, Missouri, a small, largely Protestant town, may seem like an unlikely site for the order’s U.S. headquarters. The Vietnamese priests moved here beginning in the mid-1970s because an American religious order was moving out due to declining numbers. At the time, Catholics were under threat in Vietnam, and priests had to go into hiding or flee. But somehow this congregation managed to survive. FATHER JOHN TRAN (Vocation Director, Congregation of the Mother Co-Redemptrix): We were born in 1952, so we’re very young, and we’re proud to say our founder is a Vietnamese priest. You know how most religious communities enter into Vietnam from other country, but we proudly say we are the one that was founded by a Vietnamese priest for the Vietnamese people. VALENTE: In recent years, as Vietnam has opened to the West, Vietnamese Catholics have regained a measure of religious freedom. Even so, the government still restricts church activities, and in some areas Catholics are barred from holding government jobs, which helps explain the deep devotion of Vietnamese Catholics living in the United States. Thousands journey to Carthage each year for the Marian Days Festival, a four-day pilgrimage to give thanks to the Virgin Mary for the safety and freedom they feel they enjoy in America. 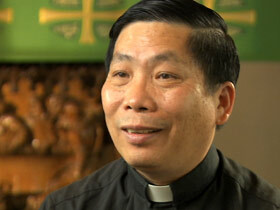 FATHER TRAN: It’s like a divine providence that we happened to be right in the middle of the United States. Everybody can come over here, you know, just the whole family gathering. But the second part is just the spiritual side of things, because through the year there’s all this hardship, working, and it’s just a week to come here just to pray and listen to conferences to nourish their spiritual side. VALENTE: About 500 people came in 1978, the first year of the festival. 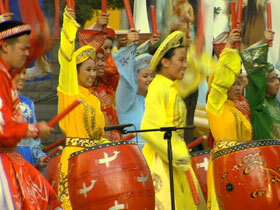 Today, between fifty- and sixty-thousand people attend, making it one of the largest ethnic festivals in the U.S. The centerpiece of the pilgrimage is this statue of the Virgin Mary, one of only six like it in the world. Vietnamese mothers usually take the lead in passing on the faith, and this has translated into a deep devotion within the community to the Blessed Mother. Sister Maria Nguyen, a Benedictine sister from Kansas, says many families also credit Mary with helping them escape communism. SISTER MARIA NGUYEN: They thank for all things that Mary and God have done for them for the past year. And, then they ask Mary to continue to journey, to be with them for this coming year, for the future. VALENTE: The Marian Days Festival allows Vietnamese priests and sisters serving in America to reconnect with their culture. Asians and Asian Americans make up only four percent of the American Catholic Church, but account for 10 percent of vocations, most of them Vietnamese, leading one observer to call Vietnamese priests “the new Irish.” Father Basil’s story is typical. He says he first began thinking about the priesthood while serving in the South Vietnamese army. FATHER BASIL: When I was in army, I felt that I am going to die. And then in my heart, I just, you know, maybe the God’s Holy Spirit inspire me and I just raise up my heart, my mind to God, and I pray. I pray and then God protect me and I escape from mine explosion. I heard the explosion, and I fell down, and I didn’t get any injury. My friend behind me got hit, and the other one got hit, too. And I think that’s a sign of God’s providence, that he wanted me to be a future priest. He protect me from harm. VALENTE: Father Basil remained in Vietnam for four years after the fall of Saigon, trying to keep out of the eye of communist officials. FATHER BASIL: Some people say, “You’re a very good person, maybe you can become a priest.” But in that time, in communist rule, nobody have to, have had to fulfill that dream. VALENTE: This is the first time Father Basil has been in charge of predominantly American parishes, ones where most of the members are farmers or retirees. He says he has struggled mightily to improve his English. VALENTE: The parish bookkeeper, Susan Costello, helps correct his grammar when he writes his Sunday homilies, and parish council members presented him with a ping-pong table, so he could take up a pastime many Americans enjoy. DONNA FOURMAN (Parishioner): His speech when he got here wasn’t really good, but every week it gets better, until he gets excited, and then he talks too fast. But we just love him. And he’s always happy and smiling, until he gets up on that altar. And then he’s all business. VALENTE: Without Father Basil, parishioners say they would probably see a priest only once a week, for Mass on Sundays, and would have to wait longer to schedule baptisms, funerals, and marriages. As it is, Father Basil is on call 24 hours a day for the people at both his parishes. (to Father Basil) What are the challenges you’ve faced in terms of your parishioners? FATHER BASIL: First of all, because I’m not American pastor, I’m Asian pastor. They to have to train the ear to understand my accent. But I think they accept me. I ask one of them, “Did you accept me because I’m a Vietnamese, different from your culture?” He said, “I accept you because you’re a priest. We need priests no matter the nationality.” The United States, they need priests, but good priests. Because I have background of my faith, my experience about my faith so I can share with them. And they share their faith with me, too. VALENTE: But preserving religious traditions from Vietnam is also important to these first- and second-generation immigrants. The Marian Days Festival draws thousands of teens. This drum group traveled to Carthage from San Jose, California. Many youngsters accompany their grandparents, though they admit they are more likely to speak to them in English than Vietnamese. ALISON PHAM (Drummer): I just like the environment, like being all together, getting to praise God as a group, especially uniting with other Vietnamese people because I know a lot of times, you know, people don’t—they lose their culture, and they don’t join together. VALENTE: The priests in Carthage worry that the rate of vocations eventually will decline among Vietnamese families, as it has among Americans. Boys used to enroll in the seminary here during high school. That’s no longer the case, and it’s becoming more difficult to attract college-age men. FATHER TRAN: Last year I didn’t get any. But this year I’m blessed enough to have five. So it’s just give and take. VALENTE: Still, the congregation currently has 150 men in the U.S. studying to be priests or brothers—a number that would thrill any other seminary. Father Tran says he hopes the example of men like Father Basil, who seem to thrive as priests, will inspire other young people to try religious life. FATHER BASIL: I live in wartime in my country. Here I feel peace. I feel peace in my heart and my mind. 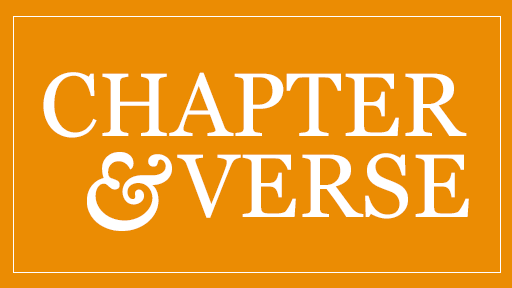 VALENTE: For Religion & Ethics NewsWeekly, I’m Judy Valente, in Carthage, Missouri.